Here’s a little puzzle that came up in the ODC database forum yesterday – I’ve got a query that has been captured by SQL Monitor, and it’s taking much longer to run than it should but the monitoring report isn’t telling me what I need to know about the time. As you can see the total elapsed time 21 seconds of which the CPU time is the whole 21 seconds. This seems a little large for a simple hash join so we should look at the “Activity Detail” section of the plan because that will report any ASH samples that can be found for this execution of this query. And that’s where the problem lies: despite using 21 CPU seconds in 21 seconds there are no ASH samples for the execution! Moreover – looking for other numerical oddities – the plan says we read 60MB in 62 read requests (that’s the first tablescan of of the 7,798 blocks of t1), but the summary says we read 180MB – where did we lose (or gain) 120MB ? Notice the two function calls that are part of the FILTER operation. That’s where the time is going – but I don’t think you can infer that from the SQL Monitor report (which rather suggests that the problem might be with the second full tablescan of t1 at operation 4). Functions f2() and f3() both do a table scan of another table that is as large as t1 – and it looks as if they’re both going to be called 400 times, which is a lot of work. The 120MB of “lost” reads is the first table scan of each of the two tables, the 3M buffer gets (in the summary, if you didn’t notice it) is from the repeated tablescans as each row comes out of the hash join and the filter is applied. Why doesn’t the report show us the CPU (and disk) samples? Because it’s querying ASH (v$active_session_history) by the SQL_ID of the principle SQL statement – and the work is being done by two other statements with different SQL_IDs. Since it’s PL/SQL functions doing all the work why isn’t the 21 CPU seconds showing up in the “PL/SQL time(s)” summary figure? Because the time isn’t being spent in PL/SQL, it’s being spent in the SQL being run by the PL/SQL. It looks as if Oracle has either cached the result of the f3() function call (in which case why didn’t it also cache the f2() result) or it’s stopped evaluating the predicate as soon as the running total exceeded zero (but that might be a problem since f3() could return a negative number !). I don’t know exactly why Oracle is doing what it’s doing – but if I reverse the order of the functions in the predicates the f3() query will run 400 times and the f2() query will run once. Following the comment below from “anonymous”, pointing out that the “Active” SQL Monitor (and, of course, the equivalent OEM screen) has a section showing the impact of everything the session has been doing while the query ran I re-ran my call to dbms_monitor.report_sql_monitor() with the “type” parameter set to ‘ACTIVE’ rather than ‘TEXT’. After spooling this to a text file (set linesize 255, set pagesize 0) with the suffix “html” and trimming the top and bottom off so that the file started and ended with opening and closing html tags, I opened it in Firefox. The print may be a little small, but in the lower half of the screen (which usually shows the plan with execution statistics) I’ve selected the “Activity” tab, and this has produced a graphic display of all the samples captured for the session while the query was running. I took this report after re-running the test case, but I had swapped the order of the two functions in the interim, so this output is showing that (from Oracle’s perspective) all the work done during the execution of the query was done by a statement with SQL_ID 85dmsgqg3bh4w. One interesting little detail, if you try the tests, is that the join has to be an outer join for the FILTER operation to appear. The first thing you’ll notice is what Oracle refers to as an INSTANCE is different to what SQL Server calls one. Oracle’s instance is most closely related to what SQL Server calls their database, (although it includes the files that Oracle includes in their description, too) and the Oracle home is *relatively* SQL Server’s version of an instance. Please also note that the Oracle architecture in the diagram isn’t 12c+ multi-tenant, a RAC, (Real Application Cluster) or has an ASM, (Automatic Storage Management) secondary instance managing the database files. All of this we’ll take on in further posts, but for today, we’ll stick to the generic, traditional architecture and simplest installation. The second major difference is in the way of background processing. Where Oracle has an Oracle executable and SQL Server has one for it’s database engine, too, Oracle also has numerous background processes running for each database. These processes each perform a job or back up another process as part of a secondary responsibility. SQL Server is multi-threaded architecture and although I can quickly assess what threads are performing what responsibilities inside the database, I’ve been unable to assess this from the server level tools, where in Oracle, each process is clearly named at the OS level of its description. Two of the major background processes are the PMON, (Process Monitor) and SMON, (System Monitor, but you will hear some people refer to it as the Session Monitor). If either of these processes die or are killed, the database instance, (i.e. the running processes and accessibility) will discontinue. Other important background processes, like RECO, (Recovery) DBWR, (Database Writer) LGWR, (Log Writer) QMNC, (Queueing Coordinator) and CKPT, (Checkpoint) address important and obvious responsibilities in a relational database. Most of the time, you can kill these individual processes and the database will restart the process and recover without the instance failing. There are also two memory processes, MMON, (Manageability manager) and MMNL, (manageability light) that are memory allocations and processing isolated to the Automatic Workload Repository, (AWR) and Active Session History, (ASH). For those in the MSSQL world, these are like the Query Store and Dynamic Management Views, (DMV) performance and session data. One of the important design features of the memory buffer isolated for this work is that it writes one way while the users read the other, eliminating much, if any locking. There is both the V$ view data and then a set of aggregated snapshots, (AWR) and samples, (ASH, also written to the snapshots) written to the AWR repository into the SYSAUX Tablespace. There’s that funny word, too- “Tablespace”. A tablespace isn’t much different than “Filegroups” in MSSQL. Its just a way of grouping logical objects into a logical space, inside a datafile. With the introduction of multi-tenant, more Oracle emphasis is shifting from schema centric data to having separate tenants, i.e. pluggable databases. This means that the architecture is becoming more similar to SQL/Azure DB, along with other multi-tenant databases and with that, simpler datafile and tablespace design. Having all the data in one tablespace isn’t viewed as negatively as it once was, along with simplifying the management of data, databases and development. Control Files are the God controls for the database. They are binary files that contain everything from transactional status in the database, undo and redo sequence to physical status of data files. Without a control file, a DBA is in a world of hurt to recover an Oracle database. Having mirrored copies of the control file is one of the first things a DBA learns as part of DBA 101. These are another important aspect of Oracle database architecture. Each database contains an UNDO tablespace that tracks all undo if something is rolled back. All of this undo, along with any redo, is written to the REDO logs. These are created in sets, just like transaction logs to handle ongoing workloads, while a second is archiving work and another is available. The busier the database, the larger and more numerous the redo logs are. These are also mirrored in case of corruption or loss, as they are necessary for recovery to undo and redo a database back to an assessible state. The redo logs are written to archive logs on a regular interval to ensure the database can be recovered for PIT, (Point in Time) recovery situations from backup. The SP, (Parameter) file is binary, but was once a text file called simply the pfile, so you may hear this term as well for those still using it. Similar to the integrated SP_CONFIGURE, it is used to set up the parameters for the database configuration, including version, naming, etc. The file is included in backups and can be copied to the text, pfile version easily. These parameters can be updated from the database management console, (UI) or the command line with the “in memory” option, which means a database cycle will be required to solidify the change or for many, scope=both, which would make the change immediate and written to the file. The Password file is configuration of password management for the database, including remote connectivity access for management. A shared option means that it can be shared among databases, eliminating extra management and setting the SYSDBA management of the database. PGA, (Process Global Area) is an allocation of memory used for sorting, hashing and PL/SQL tables, among a few things. As Oracle doesn’t have a TEMP database to perform these tasks and 99% of indexes are heap, not clustered, having this memory is essential for increased performance. The memory is outside of the SGA, (System Global Area) and its also outside of the configuration for SGA memory. This is important when a DBA is sizing out a machine and knowing that there are distinct limits per process, process type and workload for PGA allocation, no matter how much PGA is set in the SP File. Why is the sizing of the PGA important? If you don’t have enough PGA allocated or if the SQL is written poorly, a process won’t run inside of memory and will swap to TEMP tablespace. Unlike a TEMP database, a tablespace is disk allocation and disk, unless SSD, if very slow. I’m hoping this was a good introduction into how Oracle is similar and different from SQL Server. I’ll try to continue with this topic and dig in deeper as we go along and hopefully I didn’t melt anyone’s brain. Copyright © DBAKevlar [Oracle vs. SQL Server Architecture], All Right Reserved. 2019. Python is awesome. I like Python very much, but there are some cases where Python’s performance is just not enough. What other options do we have? Problem with GoLang is that there is not a lot on the Internet about using it with Oracle Databases. Let me show you some basic steps for configuring the environment. To connect to Oracle, you need Oracle Client (it can be Oracle Instant Client). To connect to Oracle, we will use goracle – it is a package which is a database/sql/driver.Driver for connecting to Oracle DB, using Anthony Tuininga’s excellent OCI wrapper, ODPI-C. Please note that we have to import goracle a bit differently than other packages – with "_" prefix. That’s because we will connect to the database like this: sql.Open("goracle", conn). So the "goracle" won’t be used directly in a code but as a string literal to SQL driver. https://ardentperf.files.wordpress.com/2019/03/hands-on-lab.jpg?w=600&h=450 600w, https://ardentperf.files.wordpress.com/2019/03/hands-on-lab.jpg?w=150&h=113 150w" sizes="(max-width: 300px) 100vw, 300px" />It feels like PostgresConf in New York is in full swing, even though the main tracks haven’t even started yet! The first two days of PostgresConf are summits, tutorials and training sessions. A good chunk of my day today was helping out with Scott Mead’s intensive 3 hour hands-on lab Setting up PostgreSQL for Production in AWS – but outside of that I’ve managed to drop in to a number of other sessions that sounded interesting. I did my best to take down some notes so I could share a few highlights. Personally, my favorite session on Monday was Brent Bigonger’s session. He’s a database engineer at Amazon who was involved in migrating their Inventory Management System to Aurora PostgreSQL (slides available here). I always love hearing good stories (part of why I’ve always been a fan of user groups) – this presentation gave a nice high level overview of the business, a review of the planning and execution process for the migration, and lots of practical lessons learned. Some of the tips were things people are generally familiar with – like NULLs behaving differently and the importance of performance management with a tool like Performance Insights. A great new tip (to me) was the idea of creating a heartbeat table as one more safety check in a replication process. You can get a sense for lag by querying the table and you can also use it during a cutover to get an extra degree of assurance that no data was missed. Another general point I really resonated with: Brent gave a nice reminder that a simple solution which meets the business requirements is better than a sophisticated or complex solution that goes beyond what the business really needs. I feel tempted on occasion to leverage architectures because they are interesting – and I always appreciate hearing this reiterated! On the AWS track, aside from Brent’s session, I caught a few others: Jim Mlodgenski giving a deep dive on Aurora PostgreSQL architecture and Jim Finnerty giving a great talk on Aurora PostgreSQL performance tuning and query plan management. It’s funny, but I think my favorite slide from Finnerty’s talk was actually one of the simplest and most basic; he had a slide that just had high-level list of steps for performance tuning. I don’t remember the exact list on that slide at the moment, but the essential process: (1) identify to top SQL (2) EXPLAIN to get the plan (3) make improvements to the SQL and (4) test and verify whether the improvements actually had the intended effect. Alvaro Hernandez giving an Oracle to PostgreSQL Migration Tutorial. 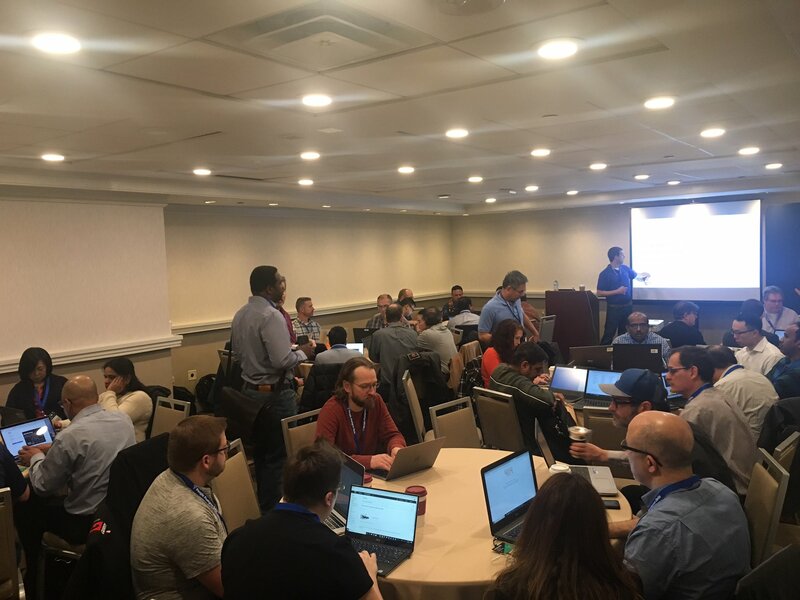 I love live demos (goes along with loving hands on labs) and so this session was a hit with me – I wasn’t able to catch the whole thing but I did catch a walk-through of ora2pg. Avinash Vallarapu giving an Introduction to PostgreSQL for Oracle and MySQL DBAs. When I slipped in, he was just wrapping up a section on hot physical backups in PostgreSQL with the pg_basebackup utility. After that, Avi launched into a section on MVCC in PostgreSQL – digging into transaction IDs and vacuum, illustrated with block dumps and the pageinspect extension. 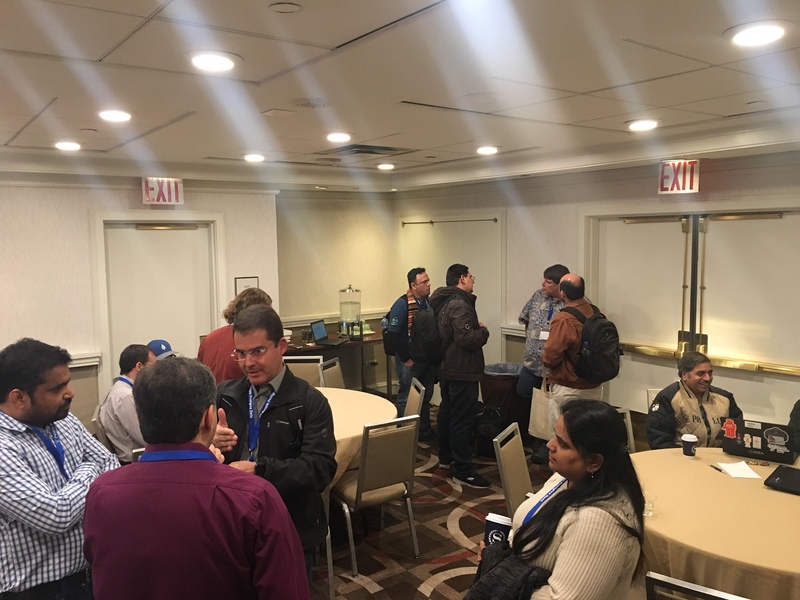 The part of this session I found most interesting was actually a few of the participant discussions – I heard lively discussions about what extensions are and about comparisons with RMAN and older versions of Oracle. As always, we had a lot of really interesting discussions with participants in the hands-on lab. We talked about the DBA role and the shared responsibility model, about new tools used to administer RDS databases in lieu of shell access (like Performance Insights and Enhanced Monitoring), and about how RDS helps implement industry best practices like standardization and automation. On a more technical level, people were interested to learn about the “pgbench” tool provided with postgresql. In addition to the lab, I also managed to catch part of Simon Riggs’ session Essential PostgreSQL11 Database Administration – in particular, the part about PostgreSQL 11 new features. One interesting new thing I learned was about some work done specifically around the performance of indexes on monotonically increasing keys. https://ardentperf.files.wordpress.com/2019/03/img_2736.jpg?w=600&h=450 600w, https://ardentperf.files.wordpress.com/2019/03/img_2736.jpg?w=150&h=113 150w" sizes="(max-width: 300px) 100vw, 300px" />Of course I learned just as much outside of the sessions as I learned in the sessions. I ended up eating lunch with Alexander Kukushkin who helped facilitate a 3 hour hands-on session today about Understanding and implementing PostgreSQL High Availability with Patroni and enjoyed hearing a bit more about PostgreSQL at Zalando. Talked with a few people from a government organization who were a long-time PostgreSQL shop and interested to hear more about Aurora PostgreSQL. Talked with a guy from a large financial and media company about flashback query, bloat and vacuum, pg_repack, parallel query and partitioning in PostgreSQL. And of course lots of discussions about the professional community. Met PostgresConf conference volunteers from California to South Africa and talked about how they got involved in the community. Saw Lloyd and chatted about the Seattle PostgreSQL User Group.